Disclosure: I participated in a campaign on behalf of Mom Central Consulting for McDonald’s. I attended an event to facilitate my review and received a promotional item as a thank you for participating. When I was growing up it was a rarity to eat fast food. That’s not to say that we ate healthy home-cooked meals every night, but the only times we really had fast food were when we drove on a road trip or had a coupon. If you fast forward a few years to my teens and twenties I was a huge fan and many breakfasts, lunches, or dinners were spent at a drive through in my busy life on the go. At that time, there were a variety of fast food restaurants I picked my food up from, but there’s something about McDonald’s that makes it the ultimate in fast food. Of course, since the golden arches are one of the first things one thinks of when it comes to fast food, McDonald’s has also received a lot of negativity in recent years regarding their food and ingredients. A few weeks ago I was invited to attend an event where we could see first hand where McDonald’s received all of their produce and the process it goes through in order to get it to your fast food tray. We also had an opportunity to attend a Q&A session with other McDonald’s suppliers about what they are doing to incorporate healthier options for McDonald’s restaurants nationwide. It was set to be a jam-packed and informative day, concluding with a delicious gourmet meal at the end! I was intrigued to find out more since I’ve noticed in the past few years McDonald’s has made some changes in their meal options in order to bring healthier meal options to the public, so I wanted to see firsthand what goes into this so I could share with you! “McDonald’s Nutrition 101”, presented by registered dietician Cathy Carmichael. Our day started bright and early at a McDonald’s restaurant in San Jose. We were fed the McDonald’s breakfast of our choice and off we went in a comfortable bus to Taylor Farms in Salinas. During the bus ride we met three of the owner/operators of some local restaurants and we also met with one of McDonald’s own registered dieticians. She spoke with us about the steps McDonald’s has taken to supply quality choices and also some requests we can make when ordering our meals to suit or specific diet or lifestyle choices. For instance, when ordering a happy meal you can request a second order of apples instead of fries. You can also remove some fat in your Big Mac by ordering it without the special sauce, or on your salad by using only part of the dressing provided. Our group in the fields of Taylor Farms. We arrived at Taylor Farms in Salinas and were instantly impressed. The entire operation runs so smoothly and efficiently. 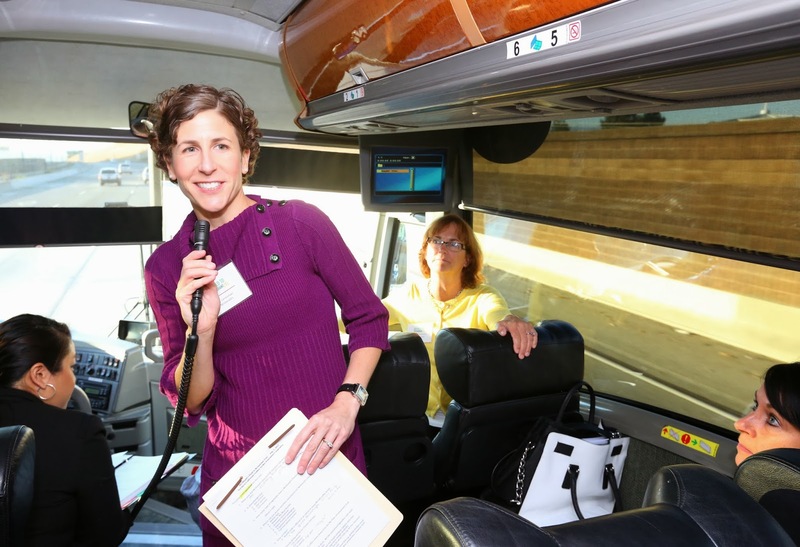 The standards are impeccable, as soon as we unboarded our bus we were required to remove all jewelry and put on hairnets and gloves. If you did not you were not allowed to step foot on the farm! I appreciate the standards being so high, as to avoid any possibility of food contamination. 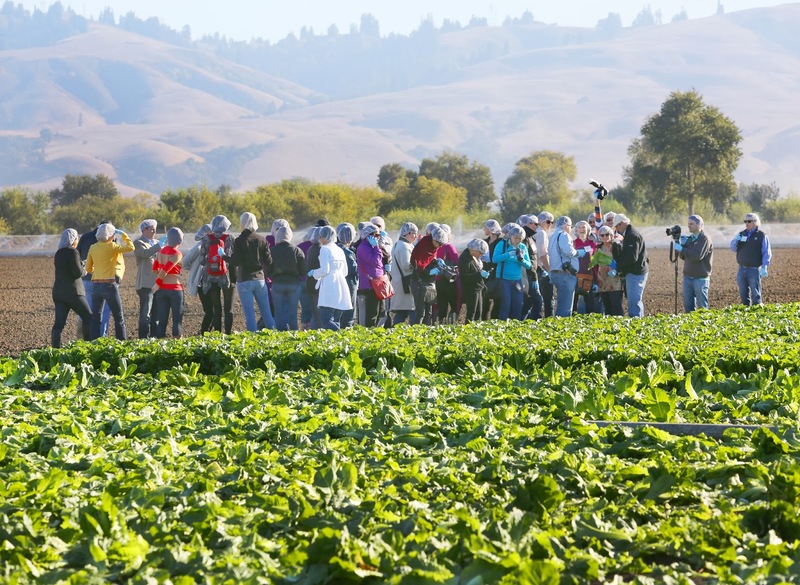 We got to walk through the fields of beautiful romaine lettuce and learn how it’s grown, harvested, cut, washed and packaged. It’s a very quick and efficient process, and those fields smelled so fresh and crisp! Taylor Farms recently implemented a machine that speeds up the process as well as saves workers backs, it was fascinating to watch! The triple washing process at Taylor Farms Processing Plant. Once we wiped the mud off our shoes and rid ourselves of our hairnets and gloves we were off to the Taylor Farms Processing Plant. Here we were able to see the triple washing process that all of the lettuce receives before it’s sent off to McDonald’s as well as many of your local grocery stores. We also learned that within six days of harvest it is at the restaurant ready to be implemented into your meals. In addition, romaine lettuce has a shelf life of 14 days, but once it’s gone past ten days McDonald’s won’t use it. This means that often the lettuce you purchase in your McDonald’s meals can be even fresher than what you can find in your grocery store! Q&A session with McDonald’s Distributors. After the informative tour of the processing plant, we sat down for a Q&A session with some of McDonald’s distributors. 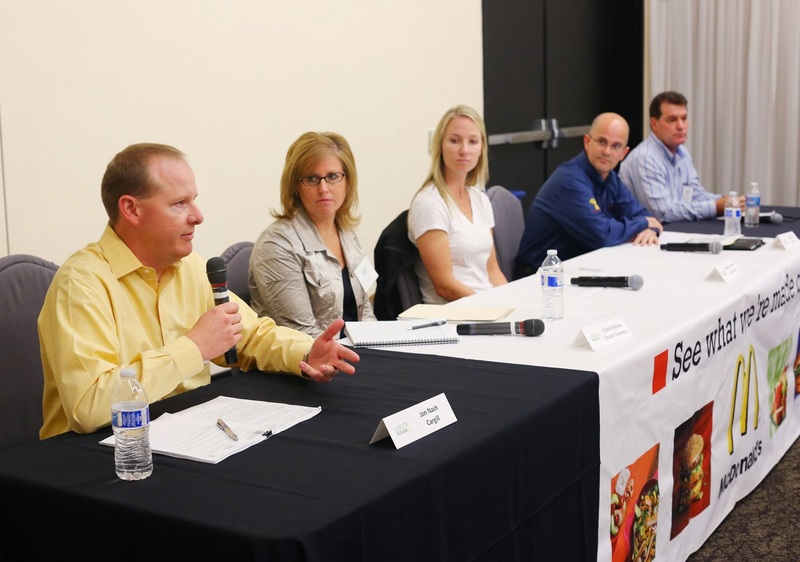 The companies represented on the panel were ARYZTA Fresh Start Bakeries, Cargill, Chiquita – Fresh Express, Crystal Creamery, and Taylor Farms. 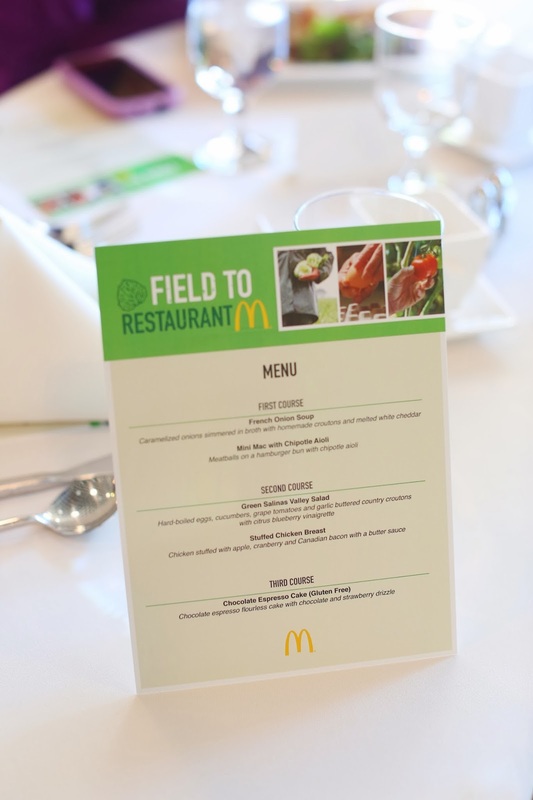 We learned that the distributors work with McDonald’s to find new and innovative ways to tweak some of the menu items so that they are healthier choices. For instance, all of the Egg McMuffins are made with whole wheat English Muffins. In addition, the hamburgers are made with 100% USDA-inspected beef with no fillers. The Chicken McNuggets are made with white meat chicken and do not go through any mechanical separation processes. They also use all white chicken meat in the Premium Chicken Sandwiches as well as the Premium Salads. McDonald’s is a leader in food safety and quality control standards as noted by organizations such as the USDA and FDA. Their Environmental Scorecard is used to measure supplier performance in the areas of water conservation, energy efficiency and waste management to ensure compliance to its stringent standards. McDonald’s and their distributors are constantly looking for new ways to satisfy their audience, so if you have ideas or opinions let them know! They are listening and doing what they can to remain a leader in the fast food industry. McDonald’s impressed me with their commitment to environmental responsibility and sourcing. For more information about McDonald’s “Commitments to Offer Improved Nutrition Choices” you can visit McDonalds.com/Changing. After such a jam packed and informative morning we were all ready to eat! Fortunately there was a fabulous three course meal prepared just for us at the beautiful National Steinbeck Center. We were served delicious food masterminded by the chef duo SakaBozzo. These two were the most adorable gentlemen that call themselves twins separated at birth. 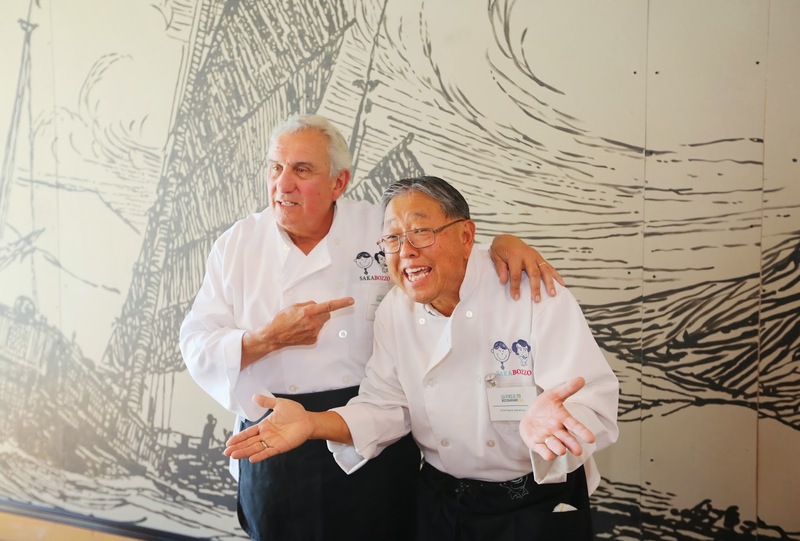 They’ve been featured numerous times at the Gilroy Garlic Festival among many other appearances and also have their very own cookbook, called “Any Bozzo Can Cook”. These two were thoroughly entertaining, and the food was ah-mazing! We discovered a little surprise after we’d scarfed down all of our courses. Everything on the menu was created using all of the food from McDonald’s!! 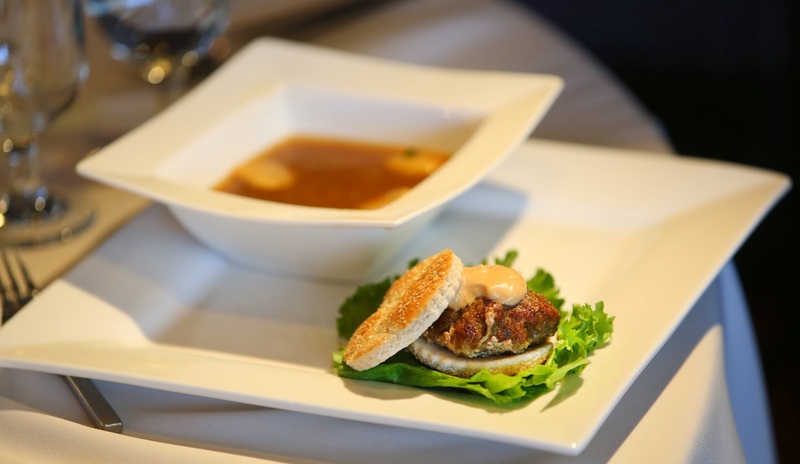 The menu for our delicious three course gourmet meal, all made with food found on the McDonald’s menu! French Onion Soup and Mini Mac with Chipotle Aioli. The Mini Mac was one of my favorites of the meal! 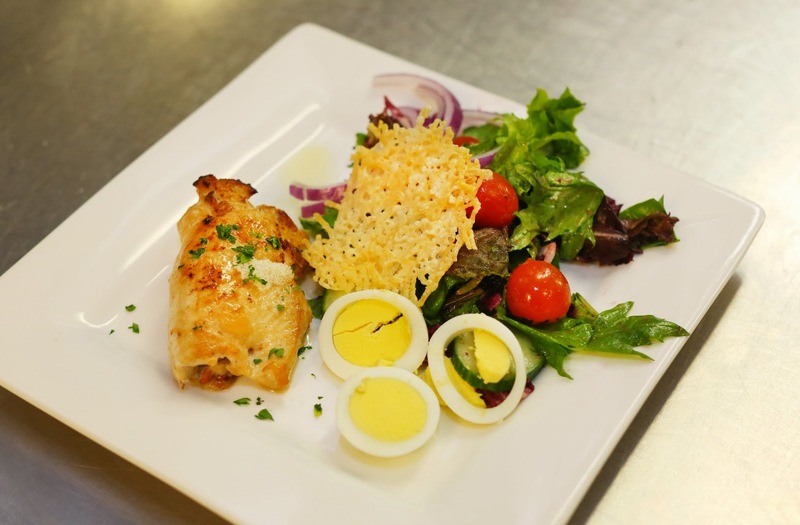 Green Salinas Valley Salad with Stuffed Chicken Breast. That chicken was to die for! 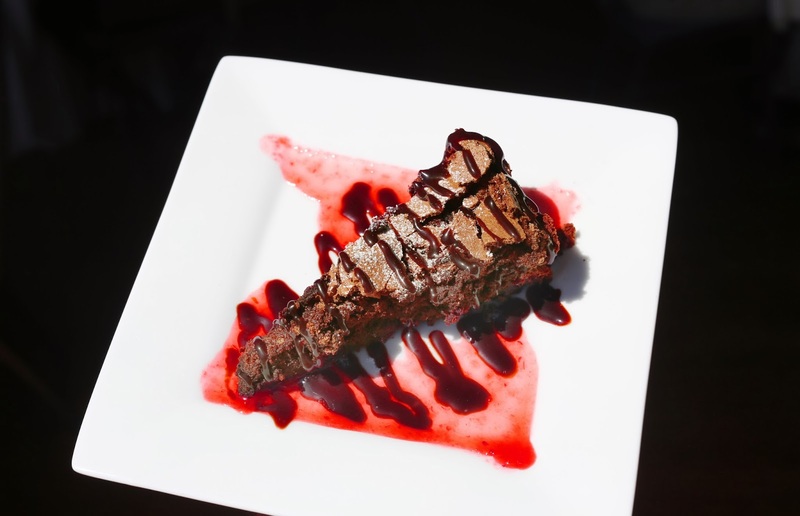 Chocolate Espresso Cake (Gluten Free). This was so rich and delicious! Once the day had ended I walked away from this experience with a new understanding of McDonald’s as a company. I appreciate the fact that they are working so hard to change their menu to suit the changing lifestyles of their customers. I like that they are a company that listens to what the consumer wants and does what it takes to achieve and satisfy their lifestyle needs. McDonald’s has taken it upon themselves to be environmentally friendly and with a company as big as theirs it really does make a huge impact. I feel that I left this day with a bigger appreciation for McDonald’s as a company and I respect the changes they are implementing and the strides they are taking to be the best that they can be! It was great seeing you again girlie! McDonald’s and Taylor Farms definitely put on a great event!!! It was great to see you too, and yes I had a great time! Amanda, it was really good! And the chipotle sauce added a unique twist. It was great to meet you too, I had a wonderful time! I love how McDonald’s is adding healthier options to their menu! Great job! I do too, great way to follow food trends and giving customers what they’re looking for!